If I hadn’t experienced it, I wouldn’t have believed that chiropractic care could have helped. We are so grateful and would recommend Dr. Lardi to anyone who is suffering from constipation. As exciting as I knew parenthood would be, I also knew that at times it would definitely be stressful. However, what I didn’t know was that there would be one issue that would consume my thoughts all day long…..will Milena poop today? I honestly never thought that I would, or even could for that matter, think about poop all day long. I also never thought that I would be so relieved when I saw poop. The sight of it eased my thoughts for at least a day. Unless you suffer from constipation yourself, or have a child that deals with constipation issues, I don’t think you can truly grasp how debilitating this condition can be. Milena had some bouts of constipation in her first year, but nothing that caused any worry. It would eventually work itself out within a day. However, at 21 months of age, Milena went through a serious bout of constipation. This lasted for about 4 months, and it progressively got worse as time went by. To put her issues into perspective, she once tried pushing on and off for 14 hours. She once has a bowel movement the size of a softball – which we still don’t understand how it made its way out. Her screams were piercing when trying to go to the bathroom. The worst however, is that there was nothing that my husband and I could do to help her. It was purely heartbreaking. During these four months, we made visits to the doctor and tested different remedies, both natural and medicinal. Nothing seemed to be a permanent fix. I have known Dr. Lardi for almost 20 years. Over a casual conversation I had mentioned what I had been experiencing with Milena. Dr. Lardi immediately identified that she could help. Although Dr. Lardi is a friend, I do have to admit that I was skeptical. However, what did I have to lose? I also knew that Dr. Lardi would not put Milena at risk and would not have recommended chiropractic care unless she truly believed that she could help Milena. I also knew how dedicated and passionate Dr. Lardi is about her profession and her genuine care towards her patients. We met with Dr. Lardi for Milena’s initial assessment. Her demeanor and gentleness put Milena at ease. After reviewing the assessment results, Dr. Lardi recommended a plan for Milena’s treatment. There were two points that stood out for me. Dr. Lardi recommended a holistic approach, which included both chiropractic care and dietary changes, which ultimately meant that she is aiming towards a permanent recovery and not an “in and out” treatment service or temporary fix. The treatment plan was frequent in terms of the appointment schedule initially, and was decreased as Milena progressed. The dietary changes were an adjustment but simple to do. 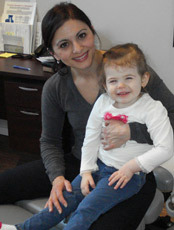 I implemented all of Dr. Lardi’s recommendations and took Milena to every appointment. I wanted to make sure that I gave this ‘treatment plan’ a fair chance. Well, I’m glad I was true to it. This treatment plan had Milena passing bowel movements once a day within 2 weeks of the start of the treatment. More importantly, these BM’s were soft, and Milena would pass them without the screams and without the look of fear in her eyes. Milena was finally not suffering, and mentally, I was not suffering anymore. This huge weight was finally lifted. It has been approximately 5 months now and Milena is still on track. We see poop on a daily basis! There may be a day where we may see some constipation tendencies, but not even 1% of what it was. Dr. Lardi’s maintenance program takes care of these issues immediately. If I hadn’t experienced it, I wouldn’t have believed that chiropractic care could have helped. We are so grateful and would recommend Dr. Lardi to anyone who is suffering from constipation.